Peggy needs Howard Stark to eliminate Zero Matter as they are faced with a mission none of them could come back from, on the season two finale. Season Two comes to a close, although apparently few people notice. While there's a cliffhanger on the show, the real cliffhanger is whether or not there's a third season. Regardless, Peggy Carter is sure to live on in other Marvel cinematic properties. A good review from the AV Club. io9: So What Was This Season of Agent Carter About, After All? This season wasn't as good as season 1, but I still enjoyed it. I liked Rose, more Rose in season 3 please. I feel like Whitney Frost as a villain started off strong and then just became ... flatter. Her end was just disappointing. Also, it would have been SO MUCH BETTER if Dottie was the one to shoot Thompson. Point of Order: Everything is better when Dottie is the one to do it. Do we have any confirmation that the M. Carter from the file is her and not her brother? His name is Matthew or something so I figured season three was going to be about clearing his name or investigating his final actions or similar. Also we don't know what the Hydra key is for, right? Anyway, this episode gripped me less (probably because of less Dottie); it was okay but it didn't have the joy and fascination for me of some earlier episodes and it felt like a lot less fun. * I am glad Ana wasn't fridged, but her injuries were also troubling. (I wouldn't necessarily feel as strongly about that if not for the weird subplot in Avengers: AoU that also hit that note.) I am glad she turned out to be super awesome though, and loved that she insisted Carter let Jarvis take her to the airport. * I am also in the 'argh gimme more Dottie' camp. Whitney Frost was all right, particularly during the three way conflict between those women, but Dottie is Carter's true opposite number/shadow archetype, and she was even more fun in S2. * Howard Stark stole the show. I wish they could have a season with more of him in it. I can see why they wouldn't - he's the only one who can upstage Peggy Carter, plus the actor's got a show of his own coming up - but man, Howard Stark was great. I especially loved that it turned out he was pals with Manfredi, because of course he was. "Let the man put the condiment down!" Also, him espousing industrial espionage was a brilliant touch, (especially given Ivan Vanko's complaints in Iron Man 2). * I liked how Thompson went out: complicated. Earlier in the season, someone said he came across like a blond Grant Ward, but I feel like he was something much more interesting by the end of this episode. (Opportunistic and dangerous, but minus the outright villain ties.) The scene where he took dinner orders was pretty great. * They do indeed need an S3 for more Rose. She was great, and there just wasn't time for more of her here, and that's a shame. * While I found the resolution to the conflict with Whitney Frost pretty underwhelming, I did love the vintage hovercar. Starks gonna Stark. Having all the characters together bouncing off each other was a real pleasure, but the resolution of the main plot was pretty anemic. This is my favorite Marvel TV show, but it almost seems it would be better for the absolutely happening season 3 to be more of a procederual with weird science mysteries being used as frameworks to let the characters hang out. Jarvis putting his hands up KILLED me. I must have rewatched it five or six times marveling at how his hands could be so high and his body so low. The Matter That Has No Name. I assumed that the M. Carter was in fact Michael, not Margaret, because Peggy didn't blink for a second at the hint about war crimes, and if she didn't know about her brother's history - which she probably wouldn't, if it was classified and he died before the war ended - then it wouldn't have any weight. It'll come back, one way or the other. I gotta believe that - it's just getting good! I was really frustrated with Thompson's arc this season. It seems like it was nothing more of a repeat of the first season. At the end of season one, it seemed like he was in a better place mentally and socially (with Peggy) then at the beginning of this season, he was back to acting like the stupid jerk he was at the very beginning of the show. So this season, he slowly comes around, and winds up in a better place mentally and socially. I guess they had no choice to kill him off, otherwise we probably would have been subjected to this same pattern all over again. Yep, also assumed M. Carter was her brother. I thought he was going to turn up again, Winter Soldier-style, later in the season, but maybe that'll be for Season 3, if it ever happens. Yes, this season was ultimately weaker, the last two episodes felt pretty stretched thin. Whitney started out as a fascinating character, but then felt stuck in the same place, obsessed by the zero matter and trying to get it, while our heroes dream up zany schemes that actually work. Compared to Dottie, the character was a dud. Season three should be all about Dottie vs Peggy. FYI, there is a general premise for Season 3 (hurrah for nosy actors! ), but we won't find if there will be one until sometime in May, but the creators aren't hopeful. As for Jack being shot, they're careful to say simply that he was shot, not that he was killed. Hurrah on Sousa and Peggy though, woot! Their banter is pretty great and it's also good to see similar banter between Peggy and Jarvis, which is non-romantic. Also, I reaaaaaaaaaally want to see that vintage hover car show up in some future Marvel tv show or movie, when we visit the zero matter dimension. Yeah...I wasn't as captivated by this season as I was the first. Honestly, I came away with the impression that Peggy didn't actually do much throughout the season. I know that can't be right, but that's how it ends up feeling to me. If the show gets a third season, I'd love to see it scaled-back a bit. Not so many characters, but a small bunch of well-written ones. Maybe even a slower, more spy/secretive pace. This season felt pretty frantic. 8 episodes seems about perfect, 10 felt too stretched out this season. I do hope there's a season 3 at some point. Atwell indicated if doesn't happen now, it could happen in a few years. Joining in the chorus of saying that this season wasn't bad, but not as good as the first. But, damn, I didn't realize that the show had low ratings and I'm genuinely angry about that. What's wrong with people? There are so many great things about this show. I'm just baffled at people who thought this was worse than S1. I found this more confident, more enjoyable. Sadly, it looks like Not Night Nurse has been ditched. I just love this show so much. Jarvis is fantastic and makes me giggle left and right. Peggy is a total badass. And I feel like a broken record but - the OUTFITS you guys. Oh my god all those tulip-sleeve blouses and dresses. Just everything was pure perfection and I would literally gasp and say "I love that dress" like 4 times every episode for different characters and costume changes. Just, perfection. I really hope we get another season because everything in this show is just great. I mean, sure I could nitpick but overall it's fantastic TV and so much better than tons of stuff out there. I agree that the resolution felt a anti-climactic. I was expecting an epic last stand by Frost, but nope. Was super surprised Thompson wasn't the one who went to close the rift while everyone else was yapping about it. Then I almost yelled at him for giving the key to Peggy. "That's the only thing keeping you alive, you idiot!" And I feel like a broken record but - the OUTFITS you guys. That last dress was pure Sinestro. Was Howard straight-up hitting on Rose? It's Howard, of course he was. And, what happened to the flamingo? I hear they go great with mustard. I'm in the 'preferred S1 over S2 camp.' There were a lot of fun scenes in S2, but it didn't feel as well-structured to me, especially the ending. Oh well. At least I have so little investment in Thompson's character that I don't mind him that cancellation will leave him as Schrodinger's SSR Agent. Actually, a lot of the outfits--the dresses in particular--bothered me. They were just way, way too low-cut for the period. There was on in particular that I think had a flower tacked onto the bottom of the V just to make sure that there wasn't so much cleavage showing. I want to believe, but await official notice. Hayley Atwell: James D’Arcy is so nosy, so he went sniffing around the writers’ room trying to figure it out. He finally found out what the secret was, and then on the last day he ran up to me and told me. That is so delightfully in keeping with Jarvis that I imagined the whole scene playing out in costume and character. Brandon Blatcher: As for Jack being shot, they're careful to say simply that he was shot, not that he was killed. Yup, that's pretty damned clear. After all, how many people survived what appeared to be fatal injuries? Thompson, Carter, Mrs. Jarvis, Ms. Frost and Wilkes, off the top of my head. It's a comic book show, unlikely survival is key to the fabric of this world. Speaking of comic book adaptations - because this is a period show, and characters get the chance to be goofier (you know, because that's how people were then), which makes me like this so much more than Agents of S.H.I.E.L.D. So many pretty, smug fighting types, so many annoying dramas plaid out. Whitney started out as a fascinating character, but then felt stuck in the same place, obsessed by the zero matter and trying to get it, while our heroes dream up zany schemes that actually work. 2) Because so much of the plot revolves around Frost trying to get MOAR ZERO MATTER, even when Peggy is taking action, the "action" is more telling her crew, "Build me another flux capacitor, boys!" I get the idea that the show was trying to contrast "Peggy Carter Has A Posse" vs. Whitney Frost being increasingly isolated, but the plot MacGuffin was a tech thing, and Peggy's not a tech, which kinda left her with not much to do too much of the time. I could see how they wouldn't want to repeat the first season (or other MCU plots) too closely, but something like having Frost actually start using the Secret Council once she took it over, and then having Peggy & crew try to figure out who this Secret Council is and what they want and how thoroughly they've infiltrated the government and society would've played more to the strengths of the show and Peggy's skills and character. More spy/secretive stuff, less whiz-bang end-of-the-world magic/tech stuff. Plus I was honestly disappointed that there wasn't more attention paid to the idea of all of this leading to Peggy & Howard creating SHIELD out of the ashes of the SSR. No love for Matt Braunger as Dr. Samberly? He was hilarious. Is this where we mourn what might have been? So disappointed in the cancellation. There was a ton of potential here, and I wish it had caught on. But it overall lacked a long-term vision. I expected this show was going to be more about the founding of SSR/SHIELD, instead of what Peggy was up to before that point. It just didn't seem to be building to anything, and felt more like a prequel to the origin. This wasn't even "Bruce Wayne at Boarding School", it was more like "Jimmy Olsen Goes to Photojournalism School" or "Elevator Days: The Story of Willie Lumpkin". Why tell the third- or fourth-most interesting story about a secondary character? Ah, well. At least we got two seasons of fun. I just wish it had been more world-foundational than background colour. The best idea I saw: Netflix movies. The other idea I like: 1960s MCU: Carter, Fury.... and Coulson's flying car. And a hiden barber shop. Why did it rate so badly. I heard it was up against NCIS and... stuff, but it's the summer (or winter) break. Too expensive? Peggy was great, and I am sure we will see her again, I am just not sure where. This made me sad. Granted, the second season wasn't nearly as good as the first. But this was such a different show, in all the best ways. I agree withe the Netflix movies idea. 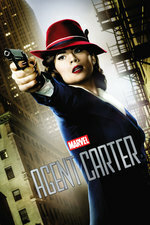 Atwell is going to be busy on her new ABC series but if they can borrow her long enough to knock out a 100 minute Peggy Carter adventure, that would be cool. Something else that could actually be awesome would be if they could find a way to incorporate her into an Agents of SHIELD storyline that finally went into some detail about how SSR became SHIELD. That show could use an injection of awesome. I think the entire shared universe thing could end up being a game changer in terms of extending how long character stories can play out on tv. Look, for instance, at the way that Constantine has popped up again on Arrow. There's no reason Marvel can't do that, too. So fine, Agent Carter is canceled. So what? Hayley Atwell is alive and well and loves playing her. Pencil her in to star in a revelatory flashback sequence in some later Marvel film. Marvel's Most Wanted didn't get picked up? So what? Have Mockingbird guest star on The Defenders. Children of Tendu special episode regarding yesterday's cancellations - with Agent Carter's Jose Molina.